ROTARY SCREW COMPRESSOR OR RECIPROCATING COMPRESSOR: WHICH ONE’S RIGHT FOR YOU? Compressed air supplies power for many different manufacturing operations and is often preferred to electricity because it is safer and more convenient. The basic compressor converts electric, gas or diesel engine power into kinetic energy by pressurizing and compressing air. The air is then released in short bursts. In the automotive field alone, compressed air is speeding up processes and body shops are relying on it for their daily operations. Auto body shops utilize compressed air for fast tire inflation and finishing services, such as painting. Vehicles are given precision paint jobs in shorter amounts of time with paint spray guns. Additionally, most of the hand tools found in auto body shops run on compressed air. 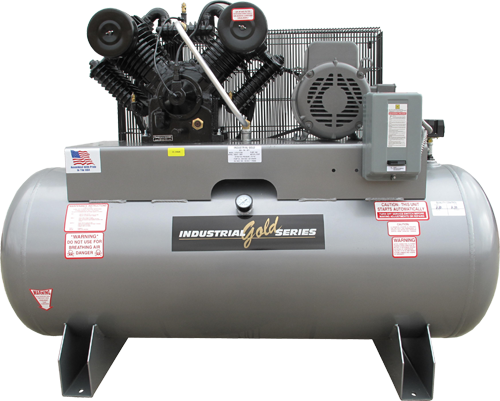 In vehicle repair shops, air compressors are a necessity for plasma cutting and welding operations as well as drills, screwdrivers, nutrunner sockets, fasteners, and sanders. I have sold a lot of compressors recently and I am always asked why one is better than another. What’s the difference between a rotary screw compressor and a reciprocating air compressor? 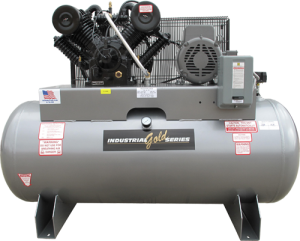 Rotary screw compressors, like these from Tools USA, tend to be compact and are the right choice for you if your application requires air all day or has multiple shifts that use air on a consistent basis. It has the ability to run all day, every day. Rotary screw compressors are perfect where large volumes of high pressure air are needed. For example, large industrial applications or to operate high-power air tools such as jackhammers. Applications above 30 hp and for air up to 150 psig. According Plant Engineering, a rotary screw compressor, if well-maintained, can provide a decade of dependable service. This type of compressor, that operates above 30 horse power, also has the ability to tell you when the oil is low and indicate oil change intervals based on operating temperatures. This will increase reliability and longevity for your compressor. The rotary screw compressor has lower costs to maintain, and cost less to purchase. 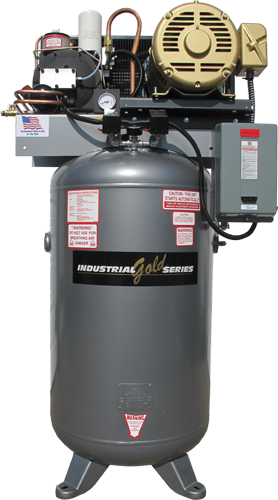 A reciprocating air compressor, or piston compressor, is a low horsepower compressor for applications where reliability is vital. Reciprocating compressors are best for applications that require air for shorter durations of time and have breaks between uses. The reciprocating compressors cost more, are louder to use, but more energy efficient. Energy costs are reduced by as much as 20%! 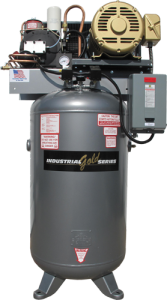 If you know you will be relying on your new compressor for daily use, Industrial Gold recommends you consider a form of backup compressor. As compressors are mechanical devices, they will need to be serviced and repaired over time. When installing a new system, look at your air needs and make sure you have a backup that will be able to handle at least 50% of your usage. This will enable you to continue working while the main compressor is being maintained or serviced. Tools USA sells a wide variety of compressors, both vertical and horizontal… rotary screw and reciprocating. 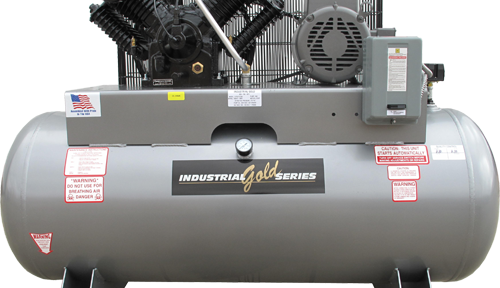 We proudly sell a full-line from Industrial Gold and have all the specs and models available on our site. Give us a call with any questions. We would love to help you decide which compressor is best for you! Previous Previous post: Change is coming with aluminum alloy body … we’re getting ready.